The moment you enter the Legend Suites at the new Amway Center, you are no longer a spectator; you’re a participant. And when you begin to experience the first-class perks and privileges, you’ll quickly realize that this is an entirely new way to experience not just the Orlando Magic, but all of the extraordinary live events that pass through the Amway Center. 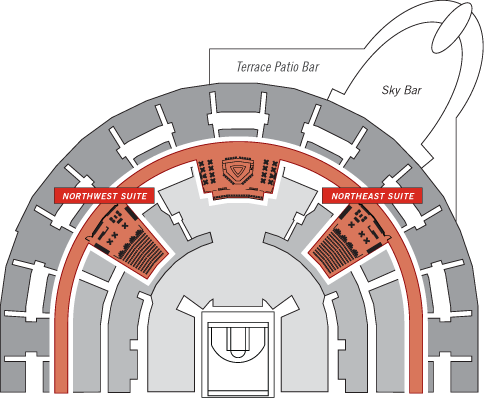 Whether you decide to purchase a block of seats or just two, you and your guests will enjoy the luxury of a private suite with the accessibility of a premium club. The game has officially changed. *Some benefits are subject to change for select events or may be exclusive to Orlando Magic games. Parking passes are for Orlando Magic Season Ticket Holders. Food & beverage may not be included during select events. For more information please call 407.89.MAGIC and choose option 5. For more information on the Legend Suites, please call 407.89.MAGIC and select option "5".